When she started running ahead of us, we decided we needed to start teaching her basic getting unlost skills. 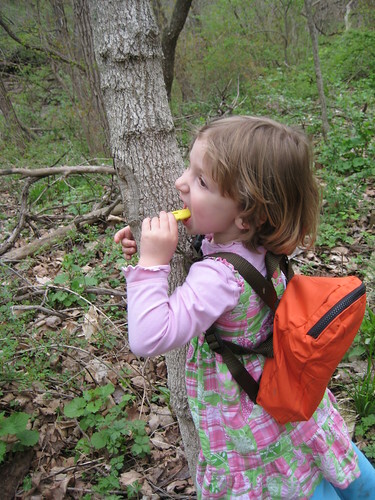 First was “If you get lost, hug a tree and stay put.” Then we got her a whistle. The first whistle she had was a yellow one like this. It was too easy for her to cover the holes with her mouth. Many backpacks come with whistles built in to the sternum strap (like this). While I can make an OK tweet on one, Boo doesn’t have sufficient control to keep the holes uncovered and make any noise. It’s a nice backup, but not sufficient for her yet. Now she uses an orange whistle like this. She likes it best. The sound holes are furthest away from the mouth, so she’s most successful making noise with this type. We do have her practice with them occasionally, in situations where nobody is likely to mistake it for an actual emergency call (trail head, back yard…). The other thing we do is put her whistle on a break-awayneck lanyard. We bought a pack online, and I cut out 5-6” of the strap to make the length better for her. It stays looped on her backpack, or is a safe necklace. We did lose one once, but I’d rather she have the breakaway safety feature right now. I’ve considered a bigger whistle with the holes even further away and harder to cover up, but I’m afraid those are too big for a good little kid necklace. Thoughts? The boy had three whistles on him the last time we discussed it. One plain yellow whistle, an two that were parts of emergency/survival multi-use things. What whistle (if any) do your kids carry?